BAC entered its second decade with the arrival of engine designer Roy Fedden whose Jupiter radial is credited with keeping the company in business at a time when demand for 'Bristol' aircraft had fallen. The 1920s were partly characterised by the split between the 'bright young things', who had the escaped the war and wanted to enjoy to the full the excesses of the Jazz Age, and those scarred by the horrors they had witnessed at the front who struggled to adjust to the new fast-paced, hedonistic way of life. It was also a decade that saw the US, unhampered by the physical devastation experienced in Europe, surging ahead as a world power with a booming industrial economy. Much of that optimism ended with the shock of the Wall Street Crash in 1929 which heralded the start of the Great Depression. British & Colonial Aeroplane Company formally wound up to protect wartime profit. Assets transferred to Bristol Aeroplane Company. Pullman airliner, a variation on the Braemar, shown at Olympia but does not go into production. Cosmos Engineering assets and team, led by Roy Fedden, acquired by BAC to form new engine division at Filton, later expanding to Patchway. First flight with practical retractable undercarriage. 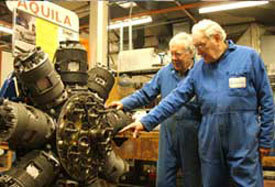 Jupiter air-cooled radial engine starts production. First test sinking of battleship by aerial bombing. Limited success with the Racer, a one-off high-speed cantilever winged monoplane powered by the Jupiter. Major General Sir Sefton Brancker, who had his first flight in a Bristol Boxkite during the Indian tour of 1911, is appointed UK Director of Civil Aviation. First airliner collision. First airliner night flight. 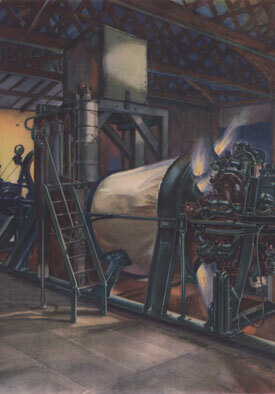 Archibald E Russell joins company, going on to lead the teams which designed the airframes of Brabazon, Freighter, Britannia and Concorde, among other projects. First Jupiters delivered to RAF. First University Air Squadron formed. Bulldog's first flight, the most successful 'Bristol' production aircraft of the 1920s. First solo transatlantic flight (Lindbergh). Jupiter powers Junkers aircraft to set new world altitude record. First flight of Dornier Do X flying boat. 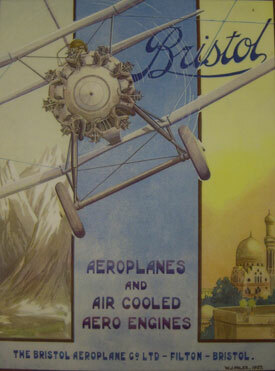 Early advertisement for BAC (Bristol Aero Collection). Jupiter on testbed (Bristol Aero Collection). 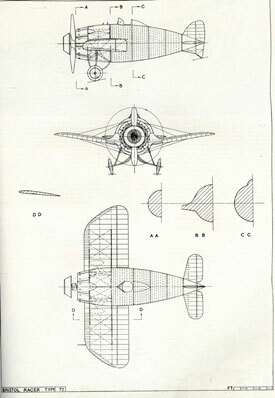 Plan drawing of Racer (Bristol Aero Collection). 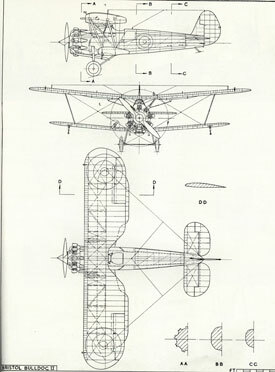 Plan drawing of Bulldog (Bristol Aero Collection). See Jupiters and other original 'Bristol' radial engines at the Rolls-Royce Heritage Trust at Patchway. Search the Aviation Archive for images of West of England aircraft in the 1920s.